Every day, we have to complete lots of tasks. And since it’s the beginning of the year, many of us have set up some goals we want to achieve. In most cases, nobody has taught us how to stay organised and we ended up finding our own solutions. 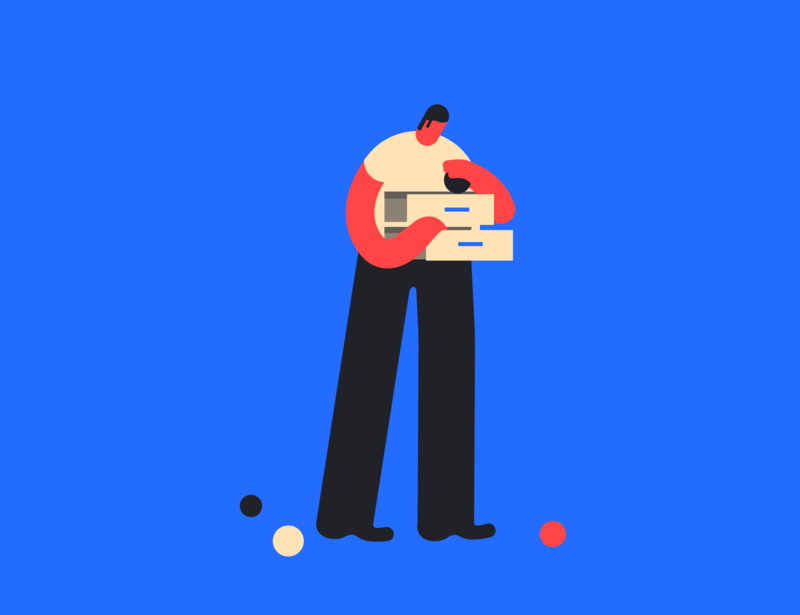 We trust our overloaded brains will remember all the tasks and deadlines, and because our brains are busy enough being creatives, solving problems and remembering more important things, we usually forget things. Over the years, I’ve been studying and implementing different productivity systems, including sophisticated approaches like GTD and simple ones like writing down my tasks on paper. After a lot of trial and error, I found a very simple system that works great for me and helps me to be productive and having everything under control. The method I use involves using a to-do list and a calendar. I use apps, but it’s also possible to use paper equivalents. I can access them from anywhere. From my phone, my computer or from the web versions. I can move and duplicate tasks and events without writing them again. I can set up alarms. They help me to live a paperless and minimal life. Some people confuse them. There is a very simple rule to differentiate them. The to-do list is for tasks. The calendar is for events. Tasks always require actions to be completed, while events happen by themselves, and may require being part of it. It’s true that we need to complete some tasks beforehand for certain events, but those are tasks associated with the event, and they are not part of the event. For instance: A meeting for the next week might require to do some tasks beforehand as gathering some information or preparing some documents. I use Google Calendar, and I sync it with all my devices using apps (Mac and iPhone). For all the personal matters as trips, scheduled meetings, scheduled calls or visits. Working related events as deadlines, meetings or scheduled calls. Upcoming deadlines for contests as American Illustration, 3×3 or Applied Arts. Leisure Last day of exhibitions, movies or another kind of events that I might be interested in going. Each calendar has a different colour. That’s very useful since I can distinguish them very quickly in a very visual way. Some events like meetings, calls or flights have defined a specific duration. Others like illustration deadlines or contests are whole day events. When possible, I add the address of the event. It helps when I’m on my way, and I need to know exactly where the event is. Sometimes I set up alarms for some events. Depending on the event, I set up alarms days or hours before the events. I tried dozens of apps, and I finally chose Wunderlist. It’s free, and it has apps for all the main platforms. I love its great instant sync, minimalistic design and accuracy. There are other more sophisticated solutions out there, but Wunderlist works like a charm for me. As soon as a new task appears, I add it to its belonging list in Wunderlist. I assign a due date if I’m sure when I’m going to do that date, otherwise I don’t add a due date when I create the task. I don’t need to think about the task anymore until I review it in the next step. At the end of every day, I check my lists, and I chose the tasks I want to do the next day. It’s very easy; I only need to create a due date for tomorrow inside the task. I do it right clicking on a task > due Tomorrow. Reviewing the lists at the end of the day, allows me to create a very clear idea of how is going to be the next day. It also helps me to make sure I’m not missing any possible task for the following days. Every morning, I open Wunderlist and choose the task I want to start with. I mark the important tasks of the day with a star, and I focus first on them. I use keywords as create, send, do, prepare, call, clean or make. It makes the task very descriptive and easy to understand. Let’s say you need to produce a new illustration. It requires the following tasks: creating a sketch, sending the sketch, creating the final, sending the final. For instance, when I’m traveling, and I need to prepare the trip and I want to do particular things at my destination. I create temporary lists that contain all the tasks and things I want to do and I erase them when I’m done. There are dozens of tasks that repeat every particular time. Doing the laundry, cleaning the desk, shaving, paying the rent, updating the blog are some of them. Wunderlist allows me to automate that kind of tasks very quickly. Wunderlist has a lot other interesting features as subtasks, comments, attachments, or sharing options. But I don’t use them. I try to keep it as simple as possible, and make my system flexible and light. It includes all my personal and day-to-day tasks like calls, things I need to buy or house tasks. Working tasks like sending emails to clients, updating my website or sending invoices to my accountant. I use this lists purely for on process illustrations: creating sketches and finals. Tasks related to my online shop like sending orders, contacting clients, following-up shipments. It’s a special list where I add tasks that I want to achieve at some point in the future but not in the near future. Examples of this tasks could be buy a book of a particular writer, improve my email system or learning new skills. Productivity systems are crucial to getting control of our work and personal life. They allow us to focus on the important things and make sure we are on time to do all of our tasks. They also help us to achieve our goals and visualise our following days. Every person is different and has specific needs. I found over the years that using a simple and efficient way of staying organised allows me to focus on completing tasks instead of being constantly worried and feeling overwhelmed. Do you use any system? Do you use specific apps? How do you stay organised? Thank you for sharing the ways you’ve found! All this information will be useful for me creating a similar system for my needs. I got inspired and can not start this Monday morning doing anything but organising my tasks, goals and schedules. I’m really glad to read you find it useful and it inspired you to stay organised. Gracias otra vez! Una información muy muy útil! de verdad. Yo usaba muchos el sunrise calendar, pero he visto que ahora la app de google calendar está mucho mejor! Sunrise es muy buena, tanto que la compró Microsoft hace unos meses. Curiosamente le pasó lo mismo a Wunderlist. Yo en iOs uso Calendars 5 de Reedle. Me gusta mucho porque la vista mensual me permite ver todos los eventos y moverlos con mucha facilidad. Yo igual antes confiaba en mi memoria o en notas en papeles simples que terminaba perdiendo. Luego anduve en la depresión y todo se salió de control. Recientemente estoy en proceso de recuperar mi vida, conseguí un trabajo (me di cuenta que el diseño editorial es una de mis pasiones) y todo va para adelante, y wunderlist es una maravilla. Llevo rato usándola. A lo que aún no me acostumbro es a los calendarios pero voy a darles una oportunidad. Gracias por tus posts! También llevo rato leyéndote pero nunca había comentado. Un abrazo! Hola Anuka, me alegro que hayas retomado el control y que todo esté yendo para adelante. Ánimo con los calendarios y muchas gracias por compartir tu experiencia. Gracias Magoz! Me encantan tus conejos. Me hace gracia que justo este inicio de año empecé un sistema parecido pero totalmente analógico (raro que lo sea hoy en día). Sin embargo, aprecio la necesidad de tenerlo todo en el móvil y poder actualizarlo y sincronizarlo. Gracias por dedicarle tiempo a esta sección tuya de la web. Tus fans estamos pendientes de las novedades que nos ofreces! ¿Cómo te organizas en analógico? ¿Calendario y libreta? ¿O usas algún tipo de plantilla más sofisticada? sorry, I find having all those APPs is too much. Having one Cool looking leather note book where you write it down, and even sketch it out. Come people were artist let’s use our imagination! I did that in the past, but I ended up abandoning it because I didn’t carry my notebook with me all the time and I forgot to add things later when reaching home. Now I have a digital version of it in my pocket; it’s not as romantic but I can access to all my information from anywhere and at any time. I still use a paper notebook to sketch my ideas, though. En mi caso comencé con agenda física, pero no siempre la llevaba encima así que desde que tuve movil, las alarmas y calendarios me parecieron súper útiles. Hace unos años el sistema dejó de funcionar, cuando empecé con mi pfc (proyecto final de arquitectura), y entonces comencé a leer sobre GTD y planificación, prueba y error, como dices (supongo que unos métodos se iban enriqueciendo con los anteriores), hasta que di con el Bullet Journal (http://bulletjournal.com/) y ahora es el que uso porque me permite aunar eventos y tareas en el mismo lugar. Ahora me he acostumbrado a llevar siempre conmigo la libreta, aunque reconoco que la pega es que no está disponible en cualquier lugar, las tareas recurrentes no se autogeneran y si pierdes el cuaderno no tienes backup. Qué buen sistema el de Bullet Journal, no lo conocía. Me parece tremendo, sobre todo la idea de asignar los puntos, barras y círculos para eventos, tareas y notas. Y también la flexibilidad de poder moverlos entre listas. Creo que el mejor sistema analógocico que he visto hasta ahora. Una solución sencilla y brillante. Thanks so much for sharing all your tips an thoughts, Magoz! It’s pure gold for those who the chaos has the control of their lives, like me. Just wanted to ask why you prefer using Google calendar instead the native Apple calendar. What advantages do it has? Do you use any desktop calendar app on your Mac? I’m using Google Calendar because it’s more flexible to integrate it with other apps and services like ifttt. I also try to avoid Apple iCloud syncing services (even all my devices are Apple products) because I had some issues in the past and I don’t find them as fast, reliable and flexible as Google ones. At the moment, I’m using the native app Calendars on Mac and Calendars 5 on the iPhone. I use the native app Calendars on all my devices (Mac, iPhone, iPad), but I definitely will give a chance to Google Calendar and Calendars 5, they look pretty good! I’m a mac person and I love Google calendar for sharing with my hubby who is an Android user. Mac doesn’t play as friendly with androids. This way we have our calendars synced. We always race to see who gets information the fastest Siri always loses. Totally agree! Apple has a lot of work to do to improve its cloud services. Google has a lot of experience and advantage. Thanks for commenting and sharing your points, Teresa! Yo llevo un tiempo buscando y probando modos de organizarme y no acabar haciendo todo el último día, pero hasta el momento no he tenido mucho éxito. He intentado llevar a cabo el método GTD a partir de un curso que vi en Skillshare, pero me parece un poco complejo para mis necesidades. Me encanta tu sistema porque tiene la misma base, pero es mucho más sencillo. A raíz del intento con GTD y por recomendación insistente de mi hermana, comencé a usar Evernote como disco externo de mi cerebro y me parece súper útil, tanto para trabajo como para cosas personales (apunto hasta los horarios de las tiendas). Para proyectos en común, mi hermana y yo usamos Trello para la planificación. Es bastante útil porque las tareas son “tarjetas” que se pueden mover de sección en sección y puedes adjuntarles imágenes que se ven a simple vista, y hay un modo calendario también muy intuitivo. Es ideal para planificar el calendario editorial de un blog, por ejemplo. ¡Muchas gracias a ti por comentar y compartir tus experiencias! Soy un gran seguidor de tu trabajo, es todo un honor para mí tenerte por aquí. Después de varios años usando GTD llegué a la conclusión de que es un gran sistema, pero solo se le saca total partido cuando uno tiene muchas tareas en distintos planos, además de distintos proyectos. Empecé a simplificar mi vida y a partir de ahí el GTD se me quedó grande. Era como matar moscas a cañonazos. A partir de leer sistemas como el ZTD de Leo Babauta o el de Berto Pena de ThinkWasabi, adapté todo lo que había aprendido y empecé a usar uno propio y la verdad es que se ajusta muy bien a lo que yo necesito. Trello es un gran solución. Lo he recomendado muchas veces porque especialmente para trabajar en equipo y en proyectos con muchos frentes es muy visual y flexible. Tal como me pasó al final con el GTD, Trello se me hizo demasiado complejo para mis necesidades. Me interesa mucho lo que comentas del calendario. ¿Cómo organizas el calendario editorial?¿Entonces presciendes totalmente de calendario y usas el integrado en Trello? Has tocado un tema vital para mí. Evernote es mi cerebro virtual y lo uso desde hace años. Allí lo tengo todo, desde todos mis documentos oficiales digitalizados, mi biblioteca de libros ilustrados escaneados por mí, recetas de cocina, todos los recursos e información que preparo antes de cada viaje, los artículos del blog, mi colección de gifs, mis paletas de color, listas con ideas para nuevas ilustraciones… Absolutamente todo lo archivable tanto físico como virtual está ahí. Me ha ayudado muchísimo a poder vivir con poco y viajar. Tener toda esa información disponible en cualquier momento en tu bolsillo, no tiene precio. Creo que escribiré algunos artículos sobre Evernote próximamente porque creo que es una herramienta tan útil que debería venir de serie con todos los dispositivos. Sobre Trello, lo usamos el año pasado para planificar el contenido del blog y las RRSS de Let’s Pacheco. Cada tarjeta era un post/viñeta y lo movíamos en las diferentes columnas según el estado de proceso en el que se encontrara (brainstorming, escribir, boceto, final, pendiente de publicar, etc.). Si la idea pasaba del brainstorming le asignábamos una fecha de publicación. Así, si mirabas el calendario sabías qué post tocaba cuándo y cuáles corrían más prisa. La verdad es que todo el sistema lo diseñó y lo montó mi hermana, que es la que me descubre estos métodos y apps. Para hablar de trabajo usamos el chat de Slack, porque vivimos en ciudades diferentes, aunque siempre nos hablamos por varias redes a la vez. Para mis cosas y mi prueba con el GTD elegí Wunderlist, principalmente porque me gustaba más el diseño. En el curso que hice valoraban mejor Todoist como app gratis, pero creo que no hay muchas diferencias. Y uso el calendario de Google, pero también me gusta dibujármelo mes a mes en la pizarra de mi estudio. Aunque alguna vez la he liado saltándome algún día, jaja. Gracias de nuevo por compartir como te organizas. Y me alegro mucho que mi blog tenga el honor de aparecer varias veces en tu Evernote. ¡Un placer y un honor! Pues finalmente me dejé seducir por Trello. A partir de tu comentario y este vídeo le empecé a ver muchos usos en los que servía mejor que Wunderlist y Evernote. Lo uso para el calendario editorial y para compartir cosas y organizarme con mi chica. Justo estaba echando un vistazo a tu lista de recursos y he pensado “al final le convenció Trello”, jaja! Pues me alegro de que mi comentario te sirviera de ayuda. He flipado con el vídeo, aunque sólo lo he visto por encima (es larguísimo). ¡Qué completísimo me parece Trello ahora! Yo lo tengo abandonado porque hace tiempo que no programamos contenido para la web, pero con esto voy a plantearme seriamente dejar Wunderlist. Gracias a ti por tu lista de recursos y por el contenido de tu blog. Es muy inspirador y se aprende mucho. I’m really chaotic and I hope to improve my productivity using your tips, but regarding the tools I use, I just need Google Calendar, Google Docs (where I write my lists and basically everything) and Google Drive. Underlining the word Google here, it’s great! Thanks for your post, amazing read as always. Thanks, Catarina! I love the Google ecosystem as well, I use it a lot!